Although we do not install swimming pools, we can certainly help to make them special with a fine deck around the pool. This new 42'x20' pool with a 7'x7' spa is surrounded by 1200 square feet of random pattern bluestone. The 14" wide coping around both the pool and spa is also bluestone. We hid the pool skimmers underneath smaller pieces of bluestone and installed a large galvanized carriage bolt as the retractable handle. Here is a wonderful pool that was built in 1963 but mainly needed its cracked concrete deck removed and replaced with something more in keeping with its beautiful surroundings. The homeowner wanted both a sunning area and a shade area for sitting. Because of its color, we chose full-color, natural cleft bluestone for the pool deck restoration. We used a random pattern and cut the edges in sweeping curves to match the curves of the pool. A six-inch border of rounded brownstone was installed along the pool and terrace wall to soften these interfaces. Older pool is transformed with bluestone sitting area and granite stepping stones. 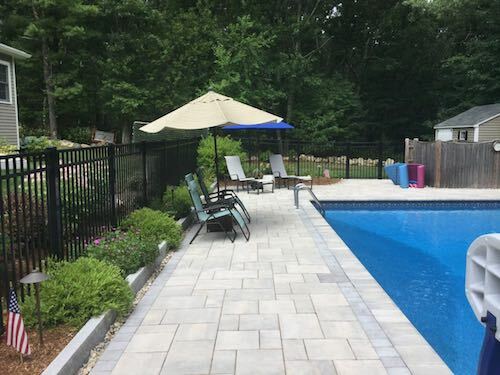 Large, sparkling Old Chester granite stepping stones set into sod connect the two patios and complete the perimeter around the pool. A well designed paver deck replaces cracked concrete and delivers the look of a new pool. The pool deck design incorporated a double border on the outside perimeter with curves to deliver the needed room for lounging. The circle kit highlights the diving board (which are now scarce, unfortunately). The pool skimmer disappears under a removable paver that becomes part of the inner boarder. A terraced pool deck with curving granite steps provides the transition between the house and the pool below. This two-tiered pool deck design included a curved retaining wall, curving granite steps plus an upper set of steps from the house. A curving trench drain is hidden under the decorative stones behind the retaining wall. It is important not to allow water buildup behind walls. Backyard redesign includes walkway to pool. Previously two sets of steps had emphasized a separation between the house and pool area below. Our design offered an inviting, gradual-declining walkway to the pool and a relaxed, pleasing view from the deck and patio above. Large granite stepping stones help to transform an older pool. Large curving granite steps with Goshen stone wall transform this pool. An interlocking paver deck sits between the large granite steps and the raised granite diving platform. 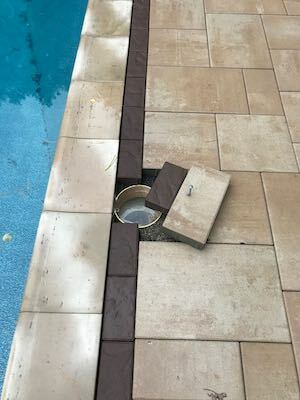 This pool skimmer cover is built with two pavers epoxied together with a carriage bolt handle at the center of gravity. Here is that same skimmer cover closed! 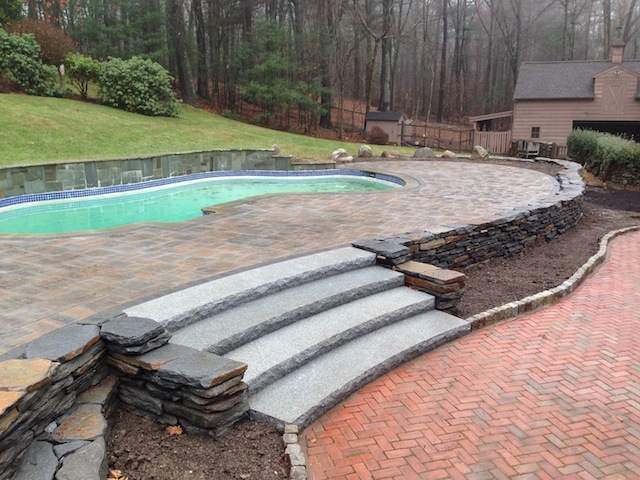 Curving granite steps and Goshen stone wall transform this pool. A failing brick wall was replaced by a dry laid Goshen stone wall with large, curving granite steps. The curve of the steps continued the curve of the wall. The paver pool deck replaced badly laid bluestone that was unbearably hot on the feet. The deck design built upon the curving pool outline and incorporated two paver circles. This brand new vinyl pool is greatly enhanced with a matching coping and pool decking. 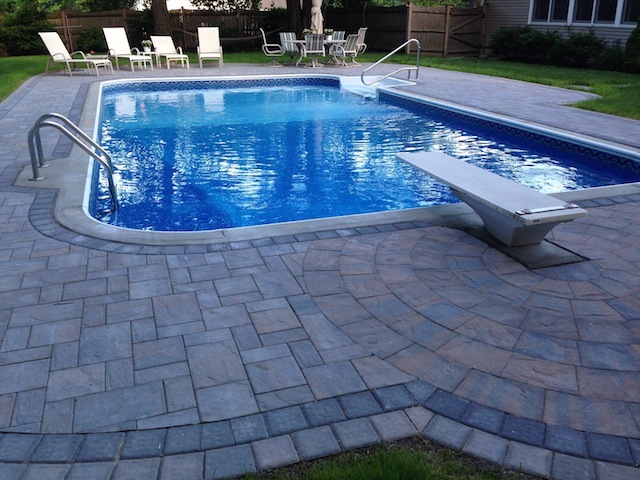 The bold paver colors with the black borders added to the excitement of the pool itself. Note that we incorporated the pool skimmer beneath a large paver in the pool border, with an embedded handle. 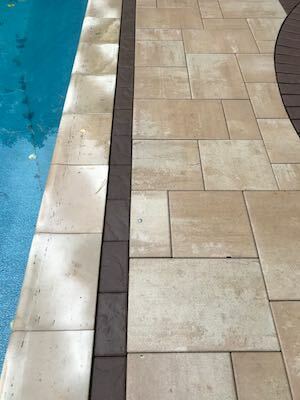 Old cracked concrete pool deck is transformed via a new design and modern pavers. 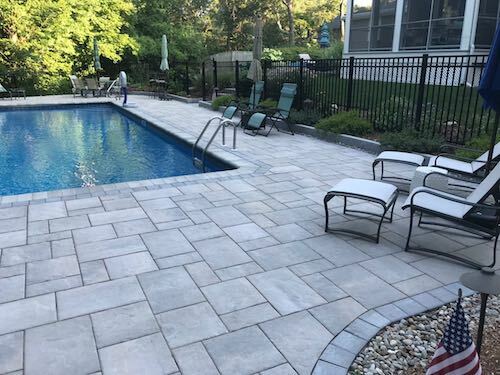 Besides building this new pool deck, this project required coordinating our schedule with the installation of a new pool liner and new pool plumbing after our excavation but before our paver installation. Note the granite curbing with rounded stone drainage that holds back the garden mulch.